I am not clear about when you plan to get rid of the brush and I am not sure how large this area is, but, if you do the clearing in the spring, you can get rid of the lion's share of the weed seeds that are there if you are willing to let them germinate and then eradicate them. Don't plant the new grass seed until Labor Day or after. This way you can allow the weed seed to sprout and then kill them a couple times over the course of the summer. You can kill them by tilling again, spraying them with store-bought white vinegar or pulling them up by hand. You could also spread sheets of clear plastic over the area and weight them down with stones. The plastic will allow the sun to raise the temperature underneath, (something like a greenhouse) that will kill the plants as they germinate. Plant the grass on Labor day or anytime in September. Next spring and summer the grass should be growing well. Simple mowing, over time, should keep the brush and weeds under control. If you are interested in planting shrubs or perennials, you can do the clearing anytime. Then, spread thick sheets of newspaper over the area and cover that with two to four inches of mulch. Cut holes in the papers or adjust them so you can plant the shrubs or perennials in the bed. 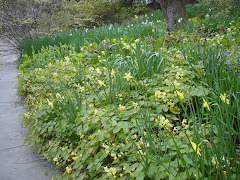 If you keep the mulch applied each year, you should be able to keep the weeds at bay.